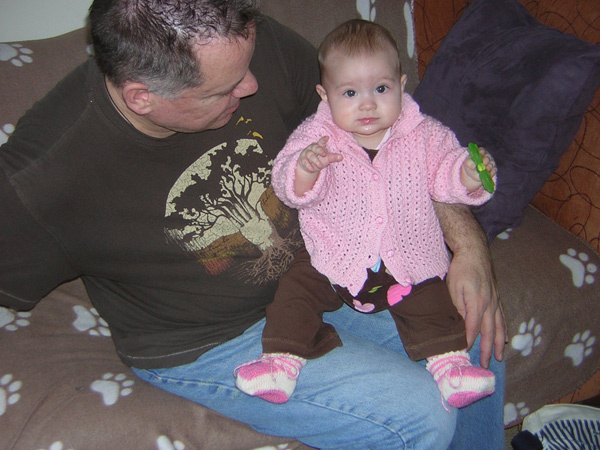 Here are two pictures of a sweater my dear friend and quilt/knitsib Karen made for Juliette. It’s just cute as a button! The sweater Karen knit for Juliette - just ignore that avocado stain! These were taken yesterday, at 7 months and 1 day, as she was on the bed playing with us after dinner, then as she drifted off to sleep and later got ready for bed. I figured today was a good day to share some happy, smiling pictures. These photos came off of momma’s camera. I finally got around to scanning them. These are for some dear friends in Norway. 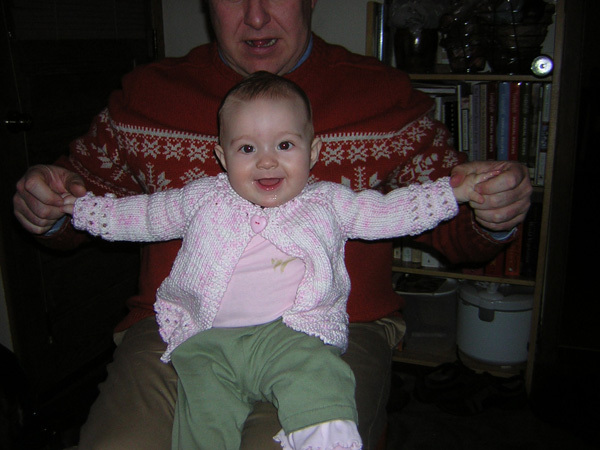 The beautiful pink sweater was hand knit by Turid, and the lovely pink and cream socks came from Ellen, Jan & Berit’s daughter. 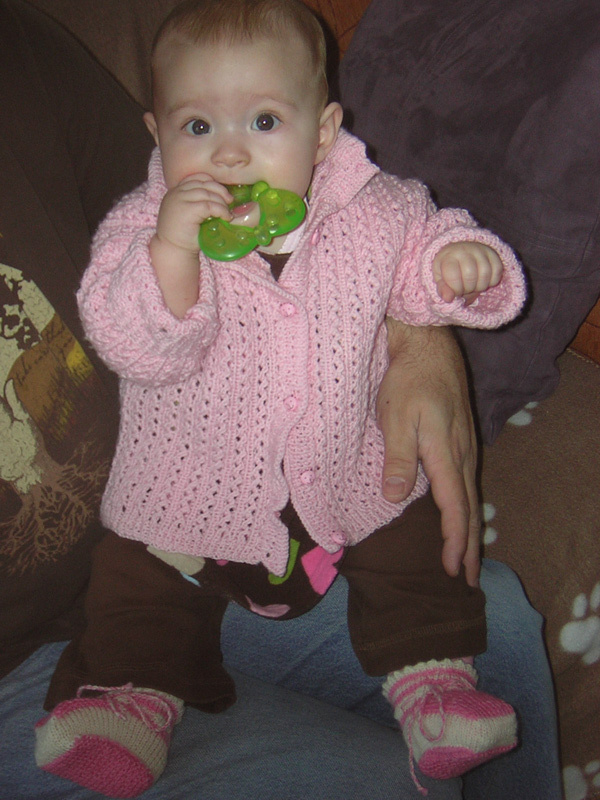 The socks are a perfect fit now, and there is much good wear in the sweater to come. They are both family heirlooms now. P.S. 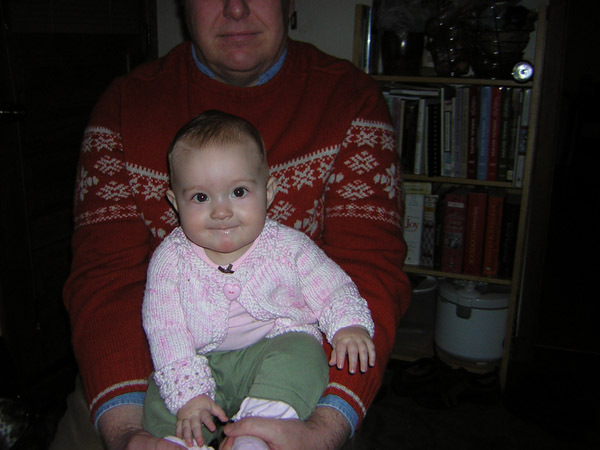 Have any idea how hard it is to create a new blog post,with pictures, with a wriggling baby in your lap???? I know, I know. It has taken me entirely too long to get these posted. But better late than never, right? There are some of my favorite pictures of Lady J in this set. Enjoy!